It is no secret I am influenced by Frida Kahlo, I featured her for F in the inspirational women series and even did an outfit inspired by her. 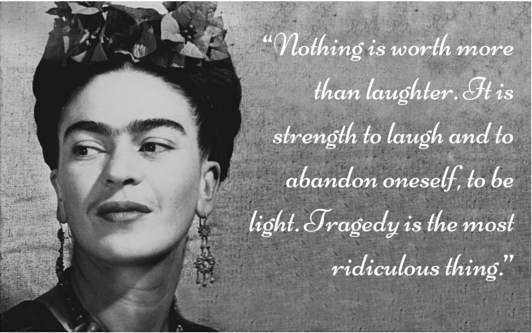 Today I want to talk about body positive lessons we can all learn from Frida, As a woman who went through so much but still remained strong throughout pushing boundaries and pretty much doing everything the world told her not to Frida is a true inspiration. 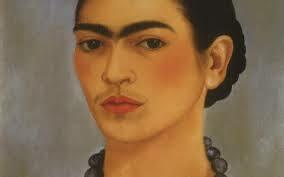 Frida Kahlo could be seen as the biggest advocate for the selfie a large portion of her work were self portraits. She painted herself because it was the subject she knew best and by doing this she could overcome and face her insecurities and openly display issues she encountered. From this we should embrace the love for ourselves. If you are someone who hides from cameras start accepting them, the power of the selfie and the use of supportive social media hashtags and communities can really empower you to love yourself more. 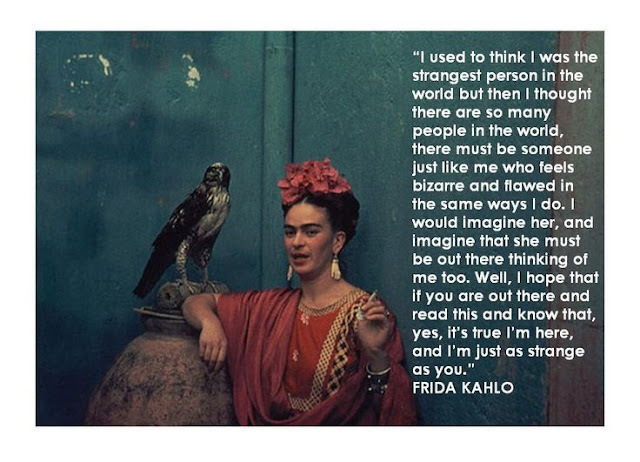 I am also a big believer that by working on oneself through art you truly get to know yourself and become free, So take a pointer from Frida and paint yourself and accept your beauty for what it is. 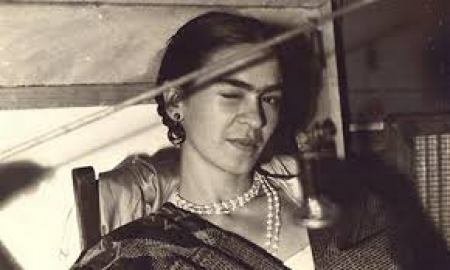 Even if you do not know who Frida Kahlo is chances you have seen a picture of her to celebrate that Body hair is beautiful. 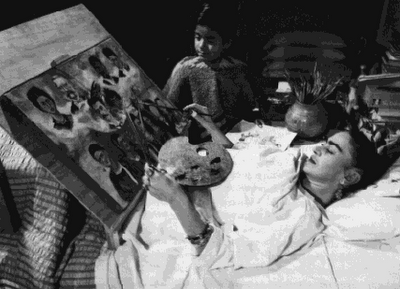 One of the things I love most about Frida is she doesn't hide the reality, she could have chose to present a filtered version of herself in her self portraits or even shaved off her body hair but she instead included them and didn't alter them because they were her reality. Society has told women for years that body hair is something unsightly and something only men should have. When realistically all humans have body hair and especially for me as a suffer of poly cystic ovaries added facial and body hair is a day to day existence. You shouldn't be ashamed of being human, you can chose to keep or get rid of your body hair but nobody should choose your beauty standard for you. 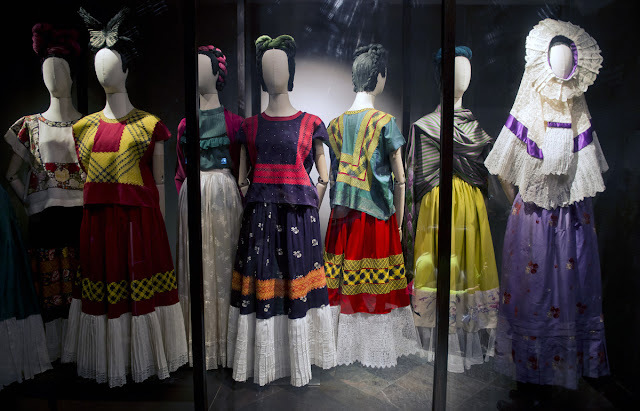 Fashion is art and Frida's wardrobe was packed full of beautiful colourful and creative clothes. Covering yourself in beautiful clothes can make the world of difference to how you feel about yourself it is almost impossible to be miserable when you clothe yourself in rainbows of colours that make you feel amazing. Take a tip from Frida and experiment with fashion, wear things you normally wouldn't dare to and push the boundaries. No life is complete without love and laughter and lots of it. The more you laugh the less stressed you will feel and those problems may become more manageable, Instead of cutting yourself down and thinking of all the things you hate about yourself or others spread love instead, I know I must sound like a new world hippy but when you start to accept yourself and not take yourself so seriously the less you care about what other people may or may not be thinking about you, Surround yourself with things that make you smile be it the ones you love or silly cartoons if your laughing and filled with happiness then the love for yourself will follow. 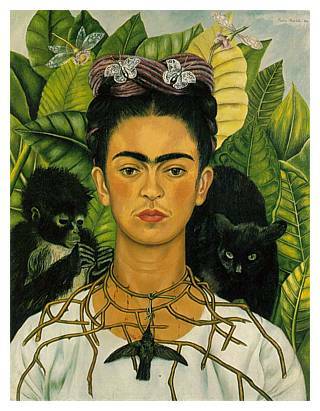 Embrace your flaws like Frida embraced her facial hair and painted her cast you too can embrace things that are seen to others or even yourself as a flaw or imperfection and instead see them as something that makes up your own perfection. Even all those traits that you think make you strange enjoy them because those are things that make you truly unique and special and if someone hasn't noticed that yet don't worry they will and you will be loved for every inch of you inside and out but first that person has to be yourself. Has Frida ever inspired you? If all selfies would as meaningful as these, portraits would be amazing!